The world is more complicated than just black and white. It’s the grey that matters — and is far more complex. 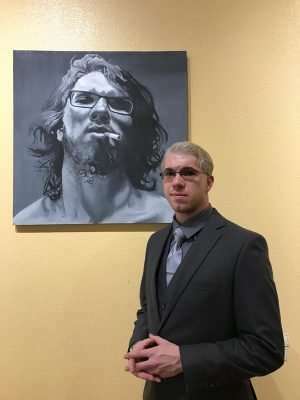 Just ask Matthew Anderson as he explores “The Grey Area” at his new art exhibition at Plumas Arts. The gallery hosts an opening reception Friday, April 5, from 5 p.m. to 7 p.m., with an artist talk at 6 p.m., for patrons to view the artist’s work. Anderson has been an artist all his life, enjoying drawing since he was a toddler. In a fourth-grade class project where students were to make a drawing from a photo he began to see that he had a talent. When his drawing was put on the wall along with those of his classmates he realized that he saw the world totally differently than anyone else. Anderson identifies challenges he has in communicating that made school troublesome for him. He found that he could communicate through drawing and that in doing so he was making interactions. “Art has put value into my life,” Anderson said. When he went to FRC he enrolled only in art classes. There he worked with Rafael Blanco who opened up the world of painting to him. “Painting is almost like a dance with the paintbrush and the oil pulling and pushing the paint across the canvas,” said Anderson. Anderson’s show is titled “The Grey Area” for a couple of reasons. One is that a number of the works in the show are painted in gray scale. The other is more philosophical. His paintings are of people. “People are complex creatures; combinations of good and bad moments and weaknesses and strengths,” Anderson said. His portraits, like people, are a mixture of shades of light and dark. Contrast of value is what makes up the whole; neither is all black and white. A signature piece in the show is a portrait from a photo of Willie Vicarage, a WW I British soldier who was grotesquely disfigured in battle. The image is compelling. In Anderson’s depiction of the soldier he works to transform the image into something beautiful that signifies courage, honor, sacrifice and responsibility. The Plumas Arts Gallery also currently features wood turnings and carvings by Taylorsville artist Donald Aitken as well as a variety of works by member artists. The exhibit will hang at the Gallery through April 27. The Plumas Arts Gallery is located at 525 Main St. in Quincy. The gallery and office hours are currently Wednesday, Thursday and Friday, from 11 a.m. to 5 p.m., or by appointment. Interested readers may also visit Plumas Arts on the web at www.plumasarts.org for more information about its programs, and to see the gallery exhibition schedule for 2019.